Based on the instruction set architecture RISC-V from the University of Berkeley, processor cores are now being developed as IP and SoCs. Cesare Garlati, founder Hex Five Security and chief security strategist at prpl Foundation, follows the development closely. In the program of this year’s Embedded World Conference, RISC-V dominates the block »Hardware Engineering«. 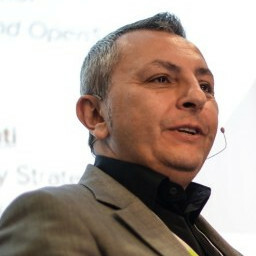 One of the speakers is Cesare Garlati, who accompanies the development of RISC-V and deals intensively with security aspects as a key member of the RISC-V Security Group and founder of Hex Five Security – the first Trusted Execution Environment for RISC-V. In an interview, he talks about the current state of technology. Mr. Garlati How far has the development of a RISC-V ecosystem progressed? The RISC-V ecosystem has grown tremendously from its beginnings as a research project at U.C. Berkeley. As of Q4 2018 the Foundation has more than 220 members in 27 countries, many open source and commercial RISC-V cores are available and a robust ecosystem of peripherals, development and software tools. Today you can find RISC-V solutions that cover everything from tiny 8-bit microcontrollers to 64-bit quad core running Linux. And even a more powerful 128-bit out-of-order core is in the makings at U.C. Berkeley – BOOM (Berkeley Out of Order Machine). Abstract — Safety and security concerns are holding back the Industrial Internet of Things (IIoT). Much of this comes down to two very different inconvenient truths: first, that Smart Cities and Connected Infrastructure are by nature composed of highly diverse sets of devices, yet device security standards are highly variable; and second, that those devices are operating in a permanently degraded state. Firmware and device data need ongoing maintenance to overcome vulnerabilities and defend against newly-discovered threats, and yet this lack of interoperability makes such patching very difficult to realize. This paper argues for standards and interoperability at a critical layer of the stack – secure boot, firmware, trusted execution environment and identity protection – in order to enable proper security management of the IIoT ecosystem. The Internet of Things, the technology that promised us utopian smart cities and connected lives, is failing to deliver. Instead of a coherent Internet of Things we have in its place an Internet of Silos, where narrow use cases may work very well, but devices, systems, and economies cannot interoperate. Differences in device standards, a lack of consistency in device security, and a ‘land-grab’, ‘winner-takes-all’ mentality on cloud management services means that while vertical walled-garden digital consumer services are making strides into the connected future, the physical world is left frustratingly behind. Abstract — The attack surface in embedded systems has grown exponentially as connectivity requirements are increasingly met with the integration of readily available 3rd party libraries. A new Zero Trust Model is required to address the intrinsic security threat posed by the resulting monolithic firmware. This paper explores a new modern approach based on open source hardware and software where security through separation is achieved via a state-of-the-art multi-domain Trusted Execution Environment (TEE) for RISC-V processors. Embedded devices are a part of the daily lives of people all around the world. As devices get more personal and become placed in increasingly sensitive environments, the security of those devices becomes paramount. Security is a multi-tier approach, with different solutions being used across the industry depending on device capabilities and functionalities. Most security challenges faced by those resource-constrained devices that make up the Internet of Things can be minimized by enforcing physical separation between functional blocks and by properly implementing established encryption schemas to protect data in transit and at rest. Abstract — The Internet of Things (IoT) represents a collection of billions of smart, connected devices. Current approaches to securing IoT devices typically go through the addition of complex hardware mechanisms or the implementation of heavy containerization and virtualization solutions. In this paper, we take the reader through designing a real-world scenario of an IoT device making use of Trusted Execution Environments (TEE) to securely isolate different parts of the system. We aim to demonstrate a network connected device resembling a typical IoT device with a clear boundary separation between the application, the networking stack, and the root of trust. The Internet of Things (IoT) field has proliferated, with current estimates at 11 billion devices according to a recent Development Bank of Singapore (DBS) report . According to the same report, privacy, security, and interoperability are the key barriers for widespread adoption . While attempts at interoperability and standardization exist with organizations such as EdgeX , privacy and security still remain largely unaddressed. IoT devices do not work in isolation, they typically need to communicate with a central manager, posting their results and accepting commands from that central manager. Typical forms of communication involve protocols like BLE and TCP/IP. These protocols bring complex serializers and de-serializers often vulnerable to buffer overflow exploits, use after free and so on, with the latest examples being vulnerable TCP/IP stacks that could be exploited . Abstract — With the advent of the Internet of Things (IoT), devices are becoming smaller, smarter and increasingly connected. This explosion in connectivity creates a larger attack surface and new security threats. Recent cybersecurity attacks clearly demonstrated that the success of this new Internet era depends heavily on the security of those embedded devices that make up the IoT. In this paper, we argue in favor of a paradigm shift in the way computing systems are conceived and designed. We explain why the free and open RISC-V ISA promises to be a game-changer for embedded security, and we share our experience developing the industry-first RISC-V secure implementation of FreeRTOS based on MultiZone Security, the first Trusted Execution Environment for RISC-V. In the context of this research, we explain how to implement user-mode interrupts to secure modern embedded systems. The world is undergoing an unprecedented technological transformation, evolving from isolated systems to ubiquitous Internet-enabled ‘things’ capable of generating and handling vast amounts of security-critical and privacy-sensitive data . This novel paradigm, commonly referred to as the Internet of Things (IoT), is a new reality that is enriching our everyday life but simultaneously creating several risks. Recent cybersecurity incidents, such as the Mirai Botnet, have clearly demonstrated that the success of this new Internet era is heavily dependent upon the trust and security built in these IoT devices. The ongoing cat-and-mouse game of hacks and patches is largely due by the intrinsic lack of security of the traditional computing model, which is not safe nor secure. Mainstream operating systems (OSes) are designed for functionality and speed. These systems follow a monolithic architecture, with most of the services enjoying privileged execution rights. Typically, programs share the same access to code and data and functional blocks communicate via shared memory structures such as buffers, stacks and hypes – a single failure in one component can bring the entire system down . Even more evolved systems that implements virtual memory protection schemas have shown several vulnerabilities, mainly due to the complexity of the software necessary to operate the underlying MMU . Abstract — The free and open RISC-V ISA defines many important building blocks of security. Properly implementing them is the system designer responsibility. So, the real question is: How does one properly secure a RISC-V embedded system? This paper offers a practical guide to using these security blocks to build a state-of-the-art Trusted Execution Environment (TEE) with a multitude of isolated security domains – Zones, and secure communications between them. The paper also shows how to verify Zone isolation and benchmark overall TEE system performance. Originally developed at U.C. Berkeley, the free and open RISC-V ISA promises to bring the innovation and collaboration of the open source community to the hardware world. When it comes to security, RISC-V specifications  provide many important building blocks and the rapidly growing RISC-V ecosystem even more. For designers used to traditional closed-source proprietary architectures, the complexity associated with properly implementing these new security technologies may prove daunting . From a system design perspective, the real question is: How do I properly secure a RISC-V embedded system? In this paper, we describe how to secure a RISC-V system using the free and open MultiZone Security Trusted Execution Environment (TEE) – developed and maintained by Hex Five Security, Inc. MultiZone Security provides signed boot, hardware enforced isolation for an unlimited number of security domains – Zones, a secure messaging system between Zones, secure interrupts, and operates on top of the standard RISC-V ISA. If you’ve been looking at SiFive‘s RISC-V-based chip technology and thinking, y’know what, it’s missing an Arm TrustZone-style element to run sensitive code, well, here’s some good news. And if you’re just into processor design and checking out alternatives to Arm CPU cores, then this may be some interesting news. SiFive helps organizations turn semiconductor designs based on the open-source RISC-V instruction set architecture (ISA) into chips. On Monday, it announced it has integrated Hex Five Security’s MultiZone Security trusted execution environment (TEE) into its Freedom SDK. The technical confection gives companies creating RISC-V chips the tools to implement a security environment comparable to ARM’s TrustZone, though perhaps without past flaws. It should help users of the SiFive toolchain bring security-enforcing silicon to market faster. Hex Five‘s technology, as its name suggests, allows for the creation of multiple isolated zones in which sensitive code – such as secure boot procedures and cryptographic routines – can run without interference from other programs or operating systems executing at the same time. It works with a Configurator tool that combines the compiled code with a Hex Five nanokernel to run within the secured environment.